Sferra Waterproofing applies innovative basement waterproofing expertise to a wide range of residential and commercial customers in Akron and the surrounding areas. Sferra Waterproofing is an authorized contractor of Grate Products, a leader in providing high-tech, reliable, and proven basement products. Only by using high quality basement waterproofing products and by having an experienced staff that has encountered and conquered virtually every waterproofing challenge imaginable, allows Sferra Waterproofing to deliver effective solutions for all waterproofing needs. At Sferra Waterproofing, you will find an indispensable source of ideas and industry know-how. Commitment and experience of our people allows for the high level of customer service and customer satisfaction. 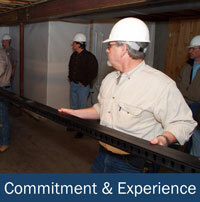 Our basement waterproofing process and product performance is unmatched in the basement waterproofing industry. All of our employees have received certified training through the Grate Products network.